7:13 the crying is unbearable even after 6 days of this you'd think I'd be trained to get used to it but sadly I'm not and I'm starting to wonder if this is the right thing for me to do. On the one hand R's night waking have reduced drastically, however the time it takes for him to fall asleep as well as the process itself has not eased much at all. Tonight after 10 minutes of crying I gave up and comforted my poor baby, I gave him a lot of kisses and distracted him from the crying by letting watch his musical mobile. He was better fit 15 minutes but then started to cry again and after another 10 minutes of crying he finally fell asleep. I really don't know if it's he's learnt to fall asleep or that he's simply exhausted from crying. This is definitely not fun. Time of sleep 7:55 pm. 3:03 - A drowsy/hungry R woke up upset and I nursed him which I kind of regret. I think I should just reinforce the method but I'm usually too sleepy myself to reason that and just do the easy thing. I think I myself am to blame for the method not completely adopted by R, it's just hard to find a balance. When should the crying be stopped and when is it ok? No one is there to draw the line or call a foul and the books always say you will know when the cries are more serious, but at the end of the day there is only you who will have to make the hard decision. 5:14 - a short burst of crying followed by lazy yelps with silence... A total of 4 minutes, if my sleepy eyes did not trick me... Back to sleep! 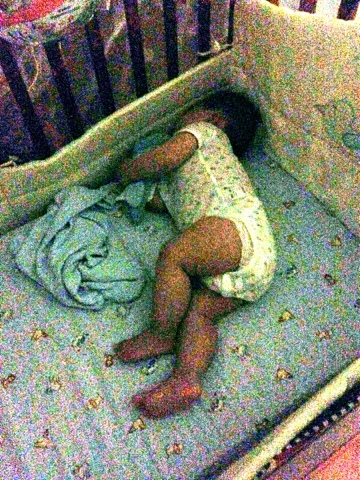 6:13 - I think R woke up there's a lot of commotion in his cot but no sounds I decided to close my eyes for a few more moments before he actually complained.